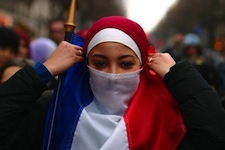 In stark contrast to the British and American attempts to push back the march of Secularism, France’s rhetoric against Islam has strengthened. The French president, Nicholas Sarkozy, is now fighting a desperate battle against the French Socialists and the far right to keep his job, and maintain the powerful Franco-German union at the reigns of power in the EU. Even as the US’s Republican Primaries rage between a fundamentalist Christian and a Mormon, France’s own Presidential race is becoming defined by the battle to claim the right-wing vote between Sarkozy and his opponent Marine Le Pen of the Front National. The Le Pen family have made their name with an extreme anti-immigrant stance and anti-Islamic position which, under the charismatic Marine, begun to sap votes from Sarkozy and risk his Presidency being seized by the centre-left leader Francois Hollande. As the battle heats up towards the election at the end of April, Sarkozy has begun to try and woo back the far-right vote. In 2010 he began the expulsion of the illegal Roma population, and later the same year the secular banning of covering of the face in public, seen by many as a direct attack on the Islamic burqa and niqab. But these moves alone have not prevented the media rise of Le Pen. Today’s announcement by Sarkozy that a large group of Islamic clerics will be forbidden entry into France for the congress organised by the French Union of Islamic Organisations. However with elections only a month away, Sarkozy has only managed to claw back 4% of the right-wing vote, leading to a taunt head-to-head with the French Socialists, which Sarkozy is still likely to lose come the second round of voting. But that 4% is a right-wing vote which makes up just a small proportion of the swing vote between Le Pen and Sarkozy, a win in the first round may give the incumbent president a boost necessary to compete against Hollande. It is also evidence of the number in France who will be swung by anyone who takes up a tough stance against Islam and the Roma, something that is not only true of France. Despite the EU speaking out in strong words against the Roma evictions, strongly enough that other nations have thought twice before bowing to popular xenophobia, the European Courts have declared the French face covering bans as “not discrimination”. France, the first to pass the ban, has a 7% Muslim population, often much higher in the cities of the south, and it has been followed with similar legislation in other states with such high populations. The Netherlands and Belgium have passed similar burqa-banning bills, and Italy has begun to enforce a similar ban which dates back to anti-terrorism legislation from the 1970s. Similar movements have grown in the United Kingdom, Germany, Denmark, Austria and Australia. Most western European nations now ban such wear in schools. Switzerland has banned the erection of minarets and Germany has shut down projects for huge new mosques in the face of right-wing rallies across the country. The anti-Islamic vote forms a large part of the interest groups in western and central Europe, and has strong ties to the powerful anti-immigration groups and the Christian right who presently rule in France, the UK and Germany. As the war in Afghanistan drags on, and Islamic fundamentalist attacks such as the recent shootings in France continue, the social and political rifts between Islamic immigrants and the home populations continue to widen. The rise of the socialist left in the wake of the Eurozone crisis may bring a return to the open-arms policy of 1990s Europe, but for now the harsh position of the anti-Islamic Christian right continues to reinforce anti-Islamic sentiment. For now the message remains integrate or leave. In France, to wear a burqa is to invite strict fines and lessons as to French citizenship in a state which takes secularism more seriously than any of their neighbours. Only a few years ago Merkel of Germany declared multiculturalism as dead, and Cameron of the United Kingdom removed it from state policy. So for now, the single assimilationist culture of Europe holds strong, and there is no place in it for the strict codes of Sharia and fundamental Islam.